Not everyone has the same attitude towards risk. Someone has more money and some have less. The person with more money may have a different attitude towards a risk, then another person who has less money or who cannot afford a risk. That's why it is important to identify the right criterion that suits your situation. 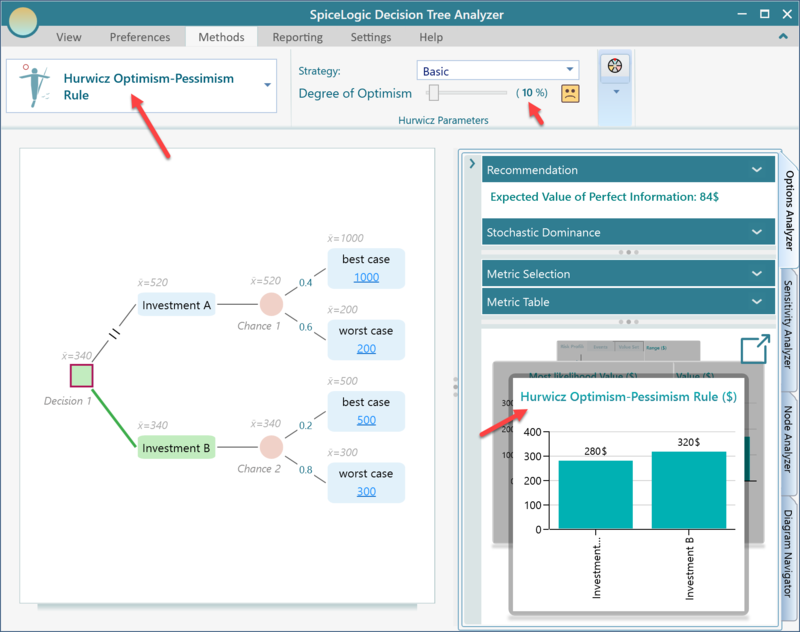 SpiceLogic Decision Tree Software supports the following decision criteria for evaluating the best strategy. "Maximize Expected Utility Criterion" is a decision-making criterion that selects the optimum action that has the highest utility value among all actions. Expected Utility means, the Expected Value of Utility. Decision Tree Software encourages you to define a utility function for any real world gain. Once utility functions are defined, Decision Maker software can calculate the Utility values for all payoff and then it calculates the Expected Utility. Then based on the Expected Utility value for different strategies, Decision Tree software will indicate the optimum path using the Green colored line as you can see in the above screenshot. If you do not model any special utility function for any objective, then this criterion will evaluate strategies based on Expected Values. By default, the Decision Tree software uses Maximize Expected Utility criterion. You can select the criterion from the Ribbon as shown in the following screenshot. In decision theory, the von Neumann-Morgenstern utility theorem shows that, under certain axioms of rational behavior, a decision-maker faced with risky (probabilistic) outcomes of different choices will behave as if he or she is maximizing the expected value of his utility function. This theorem is the basis for expected utility theory. For Number and Monetary objective, you can define a utility function. If you don't, the Decision Tree software will create a straight line Risk Neutral Utility function for you behind the scene. Which is eventually equivalent to the Expected Value. 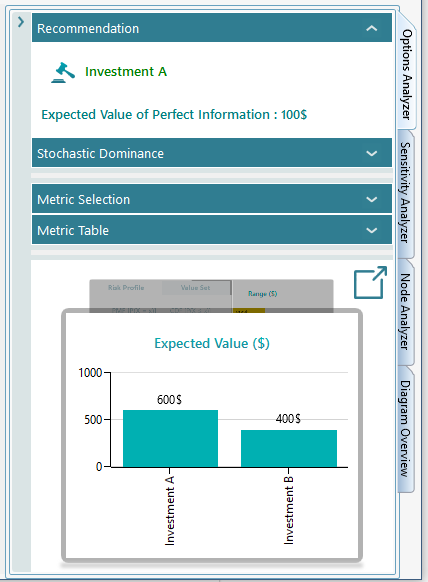 The Expected utility values are always displayed in the Option Analyzer panel's chart carousel as shown below. "Maximin" means "Maximize the Minimum Payoff". This criterion is appropriate for the Pessimist persons. Using this criterion, the decision maker looks at the worst that can happen under each action and then choose the action that has the largest payoff for the worst case scenario. The Decision-maker may believe in Murphy's law as "Anything that can go wrong will go wrong". For example, notice the above screenshot of the decision tree. The expected value for Investment A is 600$ and the expected value for Investment B is 400$. Based on the Maximize Expected Utility criterion, the Investment A is the recommended strategy. Now, if you change the criterion to "Leximin" from the ribbon as shown below, you will see the Investment B is highlighted as the recommended strategy. Because the Worst case payoff for Investment A is 200$. But the worst case payoff for Investment B is 300$. As the worst case in Investment B is higher than the worst case of Investment A, the Investment B is the recommended strategy. Maximin criterion appeals to the cautious decision maker who seeks insurance that in the event of an unfavorable outcome, there is at least a known minimum payoff. In the options analyzer chart carousel, you will see an interesting chart named "Range Chart". From the above chart, you can clearly judge an option by looking into the Minimum and Maximum possible outcome at the same time. A pessimist person will notice that Investment B's minimum outcome is higher than Investment A's minimum outcome, so he/she may choose Investment B. "Maximax" means "Maximize the Maximum Payoff". Not everyone tries to avoid risk, rather some people love to take a risk for a higher payoff. Think about the gambling. If you gamble in a Casino and if you are not worried about losing money, then most probably you will play that game which can give you a higher amount of money for the best case. This is exactly the maximax payoff criterion. For two investments, according to the maximax payoff criterion, the decision maker will choose the investment that has the higher payoff for the best case scenario. If you want to use such criterion, you can choose that from the Ribbon same like the other criterion. Practically, this criterion may be suitable for rare cases. "Minimax Regret" means, "Minimize the Maximum Regret". Maximum regret is the metric that indicates, if you choose an option, at maximum how much you can regret by not choosing other options. It is also known as opportunity cost. Let's consider the same decision tree again. If the decision maker chose the Investment B, then at worst case, Investment B can give you 300$. Then you may think that, if you chose Investment A, maximum you could get 1000$. The maximum amount you may lose is = 1000$ - 300$ = 700$. So, you may regret 700$ maximum if you choose Investment B. Same way, if you choose investment A, then you may regret maximum 500$ - 200$ = 300$. If you have an attitude to minimize the regret, then you would choose an option that has the minimum value for maximum regret. In that case, it would be the investment A. This is the Decision Criterion know as Minimax Regret Criterion. 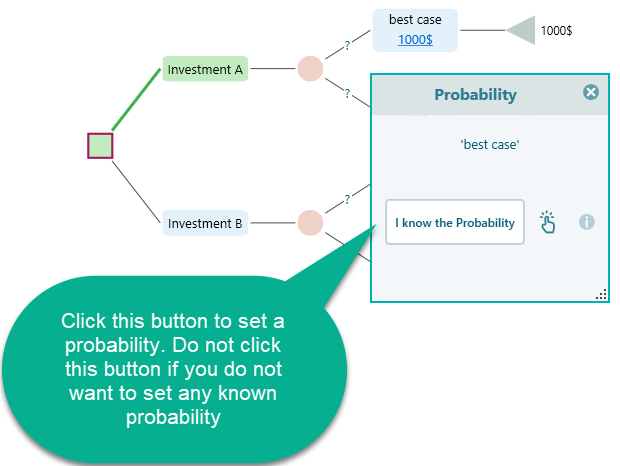 Whenever you chose the "Minimax Regret" criterion, you will find the Decision Tree is updated with the green highlighted path based on the Maximum Regret criterion. Also, the 'Maximum Regret chart' shows up in the Chart carousel as shown below. Maximum Regret is displayed with minus sign, because, it indicates the difference between the worst payoff in the action and the maximum possible payoff from the other action. 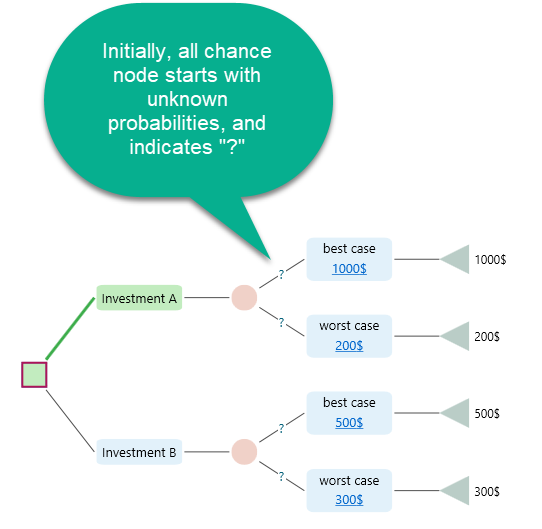 According to the most likelihood criterion, decision maker assumes that the event that has the highest probability will happen in a Chance node. Based on that assumption, the decision maker chooses the Action that has the highest payoff. Notice the following decision tree. 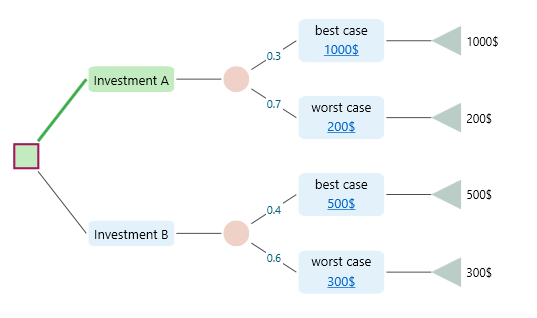 In the above tree, we see that Investment B worst case has the higher probability (0.8) than the best case probability (0.2). In the Investment A, the worst case has the higher probability (0.6) than it's best case probability (0.4). Assuming that the event with the highest probability will occur, the Investment A will give 200$ and Investment B will give 300$ according to the most likely event. Therefore, Investment B should be the recommended strategy based on the Most Likelihood criterion. You see that, in the above tree, the recommended strategy path based on most likelihood criterion is highlighted in Green color. The world would be too boring if every decision were made to avoid risks. Without being an optimist, no book could be written, no creative works could have been done. A writer takes a risk of not making up the cost of writing a book, still, he/she writes a book and many of them can make a fortune out of selling a million copies and many of them lose all the money he/she invested in the book production. But every writer takes the risk by thinking optimistic. That's why we see lots of good books in the world. The same thing happens for a movie, art, music and a lot of things. Entrepreneurs are optimistic, they take the risk and changes the world. So, does it mean that we should be delusional and extremely optimistic about our beliefs and take any risk thinking that, we will always win? No. If not, then should we always keep our money in the saving account, without investing in any business, in the fear that we will always lose? Well, that depends. Then, can we be optimistic emotional, at the same time rational? Yes, there can be a balance between optimism and pessimism. That is the idea of Hurwicz Optimism Pessimism rule. You can predefine a degree of optimism in percentage. Let's call it "Degree of Optimism". And then when you are presented with an investment opportunity with possible risks, you will judge the opportunity by taking a percentage of the best case payoff and a percentage of the worst case payoff. That percentage will be defined by that degree of optimism. Then, you can evaluate a set of investment opportunity. You can select the one that gives the highest number based on such evaluation. This criterion is called the Optimism-Pessimism rule. Suggested by Leonid Hurwicz in 1951, this criterion attempts to find a middle ground between the extremes posed by the optimist and pessimist criteria. Instead of assuming total optimism or pessimism, Hurwicz incorporates a measure of both by assigning a certain percentage weight to optimism and the rest to pessimism. It suggests that the minimum and maximum of each strategy should be averaged using α and 1 - α as weights, where α is the degree of optimism. If α is set to 0, the criterion becomes the Maximin, and if α is set to 1, the criterion becomes Maximax. Lets consider the same decision tree as we presented earlier. We set the degree of optimism α = 0.1 (or 10%). Based on that degree of optimism, the Investment A can be valued as 1000 * 0.1 + 200 * (1 - 0.1) = 280. The value of Investment B = 500 * 0.1 + 300 * (1 - 0.1) = 320. Therefore, Investment B should be considered as the winner. You can select the Hurwicz Optimism Pessimism rule from the Decision Tree software and then you can set the degree of optimism in the Hurwicz parameters tab as shown below. Therefore, Investment A becomes the optimum strategy. Now, the options analyzer chart carousel shows the following chart. If you are familiar and interested in the paper on the modifications of the Hurwicz's decision rule, You can model APO and SAPO methods of the Hurwicz Optimism Pessimism rule. By default, the Decision Tree Software software uses the original (basic) rule, as you see from the ribbon as shown here. You can expand the drop down to see the supported modifications. The software supports the original basic rule and APO and SAPO (CS) modification rules. For example, when you select the SAPO (CS) modification rule, you will see additional sliders show up in the ribbon to capture the SAPO (CS) related parameters. The Laplace’s insufficient reason criterion suggests that if there is no reason to believe that one uncertain outcome has more probability than another uncertain outcome (i.e. lack of information about the probabilities of the various outcomes), it is reasonable to assume that they are likely equally. Therefore, if there are N possible outcomes, the probability of each is 1/N. With this approach, the decision maker calculates the expected payoff for each alternative and select the alternative with the largest value. In order to use this criterion in the SpiceLogic Decision Tree Software, you just need to select the Maximize Expected Utility criterion, and then, for the chance nodes, set the probabilities as Unknown as shown here in details. Then, if you want to set the probabilities, you click on that "?" mark and the probability dialog shows up like this. 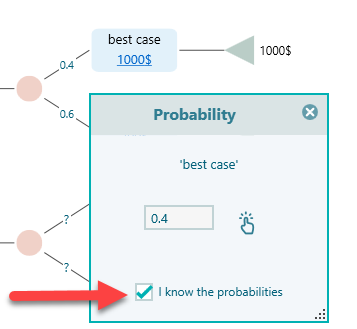 If you have already set probabilities for a chance node, you can always set them to unknown again by unchecking this checkbox. Anyway, if you do not set any probabilities for a chance node (Using unknown probabilities), then the Decision Tree software will assign equal probabilities to all events behind the scene according to the principle of indifference. So, in order to use the Laplace’s insufficient reason criterion, all you have to do is, "Not to set any probabilities for a chance node" and use the "Maximize Expected Utility" criterion.